Continue through the narthex quietly and reverently. If you wish to purchase a candle, they are available in the narthex. Candles represent the light of Christ and the flame of the Holy Spirit. You may then venerate the icons before you. The icon of the day will be on the first icon stand on the right. The Orthodox Church teaches that it is proper to venerate, not worship, icons. The acceptable way to do this is to kiss either the hands or feet of the saint depicted in the icon, or the scroll, the Gospel book, or the hand cross a saint is holding. Please be aware that it is improper to kiss the face. 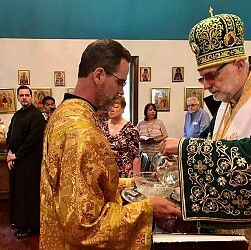 The Orthodox Divine Liturgy begins when the priest intones, “Blessed is the Kingdom of the Father, and the Son, and the Holy Spirit.” We need to arrive early enough to receive this blessing. Arriving later causes a distraction for others who are praying. If an occasional problem occurs and you have to come in late, enter the church reverently and quietly. Try not to interrupt the Liturgy by your entrance. 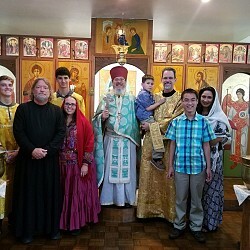 You may notice that Orthodox worshippers arrive at any point from the beginning of Matins through the early part of the Liturgy, a span of well over an hour. This is distracting to newcomers, and may even seem disrespectful, but soon you begin to recognize it as an expression of a faith that is not merely formal but very personal. Of course, there is still no good excuse for showing up after 10:00a.m. but punctuality is unfortunately one of the few virtues many Orthodox lack. Crossing oneself - To a certain extent, when to cross oneself is according to personal piety, and not an issue of dogma. It is always appropriate to cross oneself at the mention of the Holy Trinity—Father, Son, and Holy Spirit; whenever entering or leaving the church; at the beginning of the Liturgy; when passing in front of the altar; when venerating an icon, the Gospel, or the cross; and at times for personal petitions. It is not necessary to cross oneself when the priest is giving a blessing or censing the congregation. Instead, one should bow to receive the blessing. One should also not cross near the chalice, before or after receiving Holy Communion, as it is possible to hit the chalice with your hand. Kneeling - There are times when kneeling or prostration is a pious practice in the Liturgy, the most notable being at the Consecration of the Holy Gifts. You may kneel, prostrate or stand with head bowed – as is your custom. Not everyone prostrates. Some kneel, some stand with head bowed; in a pew they might slide forward and sit crouched over. Standing there feeling awkward is all right too. No one will notice if you don’t prostrate. In Orthodoxy there is a wider acceptance of individualized expressions of piety, rather than a sense that people are watching you and getting offended if you do it wrong. However, kneeling and prostration is prohibited during the Paschal season, from Pascha to Pentecost, in honor of the Resurrection. Refrain from socializing during the Liturgy - Save your greetings and conversations for the fellowship hall. We are in the Liturgy to greet God with our prayers and worship, not to distract others. Refrain from reserving seats - Allow others to sit as they come into the church and especially make room for visitors so they will feel welcome. Church Dress – Respectful attire is also an important part of attending Orthodox services. You do not need to be dressed "fancy" but respectfully and modestly so as to present yourself to God. Preferably, women should wear dresses or skirts and men should wear dress pants or suits. No shorts, short skirts or revealing clothing please. Some women have the pious tradition of covering their heads. Scarves are available for women to borrow in the narthx. Men and boys must remove their hats when entering the church. Children - Christ said, “Let the little children come to Me, and do not forbid them; for such is the kingdom of heaven” (Matthew 19:14). It is possible for young children to remain in church throughout a service if they are taught to be quiet and respectful. For those who are too small to be quiet throughout the whole Liturgy, please remove them from the nave of the church briefly if they becomes fussy or out of control. If a baby or toddler needs a snack, please clear away any leftover pieces. However, the child should not have anything in his/her mouth when he/she comes to Holy Communion. It is not acceptable at any time to chew gum in church (at any age). It is never appropriate to allow a child to run down the aisles, play loudly, or carry toys that make noise. Eventually, children will be able to spend longer times in the Liturgy. That is where they should be, but remember the reason for coming to church is to pray and worship. Plan to have your children use the restroom and get a drink before church begins, and don’t allow them to come and go continually. Consider bringing your children into the church at a time when there is no service to “practice” church behavior. Teach them that they are visiting God’s very special house, and they will need to have very special manners there. You will be surprised how quickly they can learn. Orthodox Christians are invited to approach and receive Holy Communion if they are properly prepared . Please allow godparents and parents to bring newly baptized children first. The church school students and their teachers should follow them. All others who are prepared to do so may then approach the holy chalice . Some choose to kiss the chalice and then the hand of the priest upon taking communion. The cloth held by the priest and the altar servers is there to prevent any particles of the gifts from falling onto the floor. It is not to be used as a napkin. Only Orthodox may take communion, but anyone may have some of the blessed bread. Here’s how it works: the round communion loaf, baked by a parishioner, is imprinted with a seal. In the preparation service before the Liturgy, the priest cuts out a section of the seal and sets it aside; it is called the “Lamb." The rest of the bread is cut up and placed in a large basket, and blessed by the priest. As we file past the priest, we come to a table with a basket of blessed bread and wine. People will take portions for themselves and for visitors and non-Orthodox friends around them. If someone hands you a piece of blessed bread, do not panic; it is not the eucharistic Body. It is a sign of fellowship. While antidoron is not Holy Communion, it is blessed bread, and as such should be eaten carefully so that crumbs do not fall. Both adults and children should always remember to treat and consume the antidoron with respect. "A Guide to Church Etiquette" - The Department of Marriage and Parish Family Ministry of the Antiochian Orthodox Christian Archdiocese of North America in conjunction with Conciliar Media Ministries.